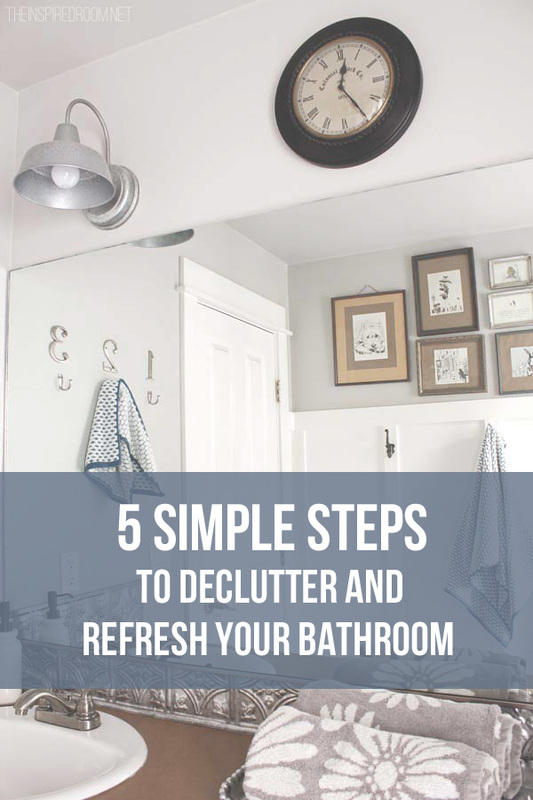 Today I’m over at The Decluttered Home, sharing five simple steps to declutter and refresh your bathroom! Come on over! This week I turned in the final chapter of my first book to my editor at my publishing company! The manuscript for Love the Home You Have is complete and has been sent off for edits! I can hardly believe it! It feels like forever ago that I (reluctantly!) wrote the book proposal, so it was very exciting to think about how far I’ve come in the process. I am really happy with how the manuscript came together and I cannot wait to share it with you all when it turns into a book! Writing a book was hard. And crazy. And challenging. And so many more things. Every step of the way I had to make decisions about how to spend my time and how to maintain my life outside of book writing. It wasn’t easy. 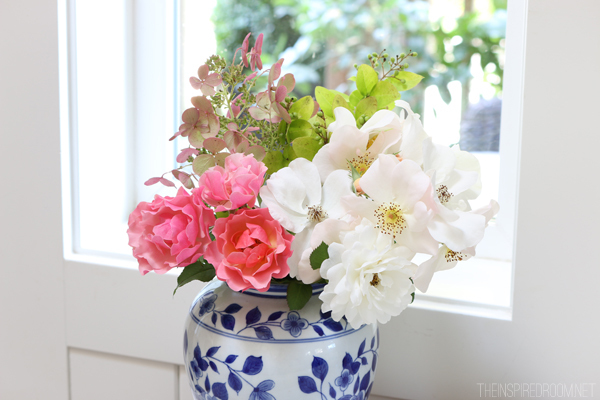 I had help at home from my family and help with the blog from my daughters and said no to more things than I wanted to. I was determined that my blog was not going to suffer any more than necessary because of the book and my blog readers would still know I was here and present on the blog. Even though I didn’t get it all right and I had to check out of life more often than I wanted to, I feel good about the fact that the blog is still going and the book was written without me having a total breakdown (the BOOKS, lest I forget to mention I was working on two other books at the same time!). But even more than juggling my work (even though I love what I do and I love you all), I’m most relieved with the fact that my home and life is still intact! I’m not super woman by any means, but there are so many little choices every day that have to be made in order to keep priorities straight and continue to be productive in a season that requires an enormous amount of emotional and physical and mental energy. Every yes meant an automatic no somewhere else. I had to say no to many things I really wanted to do, but I also continued to say yes to my most important priorities and find a rhythm of productivity and rest that worked for me. My husband and I still went on dates! I never missed a Sunday at church or serving in the church nursery. I still spent time with my family. But yet there were many things I didn’t do and things I had to say no to that bummed me out. But in order to write the book, I had to make tough decisions in order to stay on task and keep up with the deadlines. In the year preceding starting The Inspired Room, eight years ago, I read a book that inspired me. 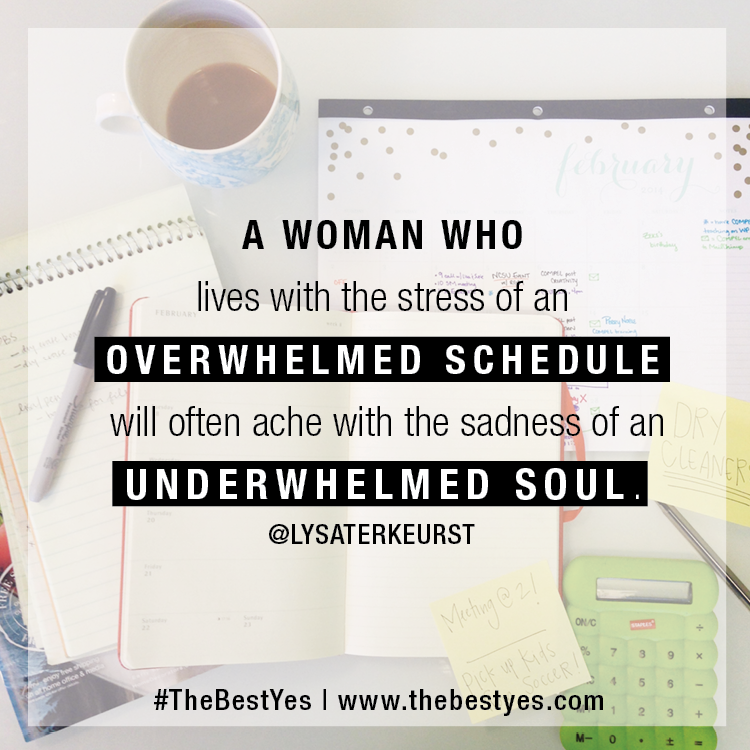 It was called When Women Say Yes to God, by Lysa Terkeurst. I was in a season of wanting to do more with my life and her book gave me the encouragement to step out of my comfort zone, seek out my purpose in life and say YES to opportunities that came my way. In the years that followed, whenever I was tempted to be afraid of challenges or stay safe and comfortable, I remembered Lysa’s words and gave my biggest, bravest YES even when I wanted to shout, NO THANKS and run to hide under the covers! So I guess you could say Lysa is at least in part responsible for the fact that I’ve run this blog for the past seven years and now I’m writing EIGHT BOOKS. That is a lot of YESSES! But I don’t regret a single one of them. Honestly, those yesses changed everything in a million good ways. 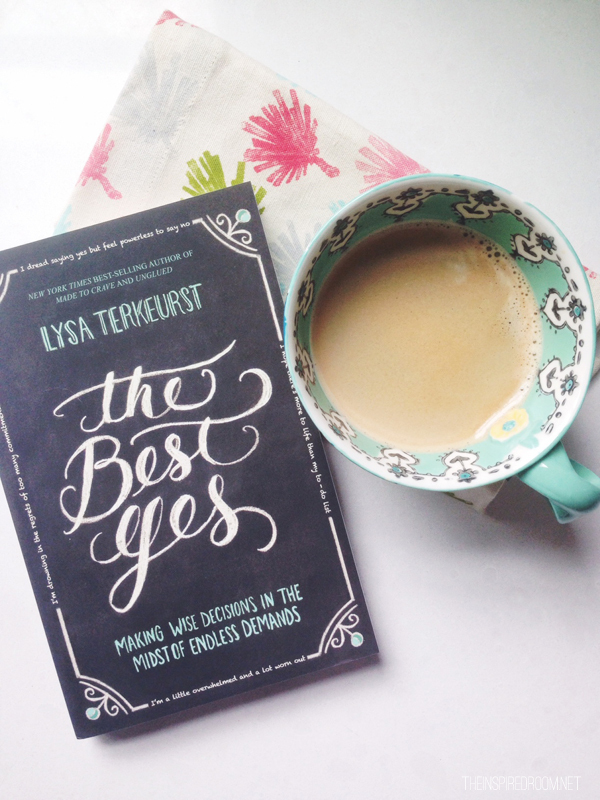 Recently I received a copy of Lysa’s newest book, The Best Yes. You better believe I was going to read it (nervously though, I mean, if her other “yes” book was responsible for all of the hard work I’ve done and lessons I’ve subsequently learned in the past seven years, then this yes book could be risky, heheh). But not only did I read it, I was once again inspired by how much her words spoke to me. While I had already nearly finished my first book writing season by the time I read her book, I so appreciated her wisdom and encouragement to know the difference between saying yes to everyone and saying yes to the things you feel God has called you to do. I feel like so many people are in a season right now of feeling the desperate desire to say no. People are tired and burned out from doing so many things. Too many things. To be honest, when you are in ministry (as we are, our family started a church five years ago, I’ll be sharing an update for our 5th anniversary in September!) hearing a YES from someone who wants to serve or do brave things in the world is a pretty rare but beautiful thing these days. Everyone is busy, stressed out or not able to juggle life. And yet, at the same time, so many people are in search of their purpose and want to make a difference in the world. They just don’t know how to get there. Knowing what to say YES to and what to say a small no to is a life-changer in so many ways! There is so much to learn in the journey. I know first hand that those big brave YESSES change everything in amazing ways. YESSES change lives. YESSES do amazing things in the world. But you have to be pretty brave to say YES to the right things, because those YESSES will not only change your life and the lives of others around you, but they will give you the courage to do even more things you might never have been brave enough to do. 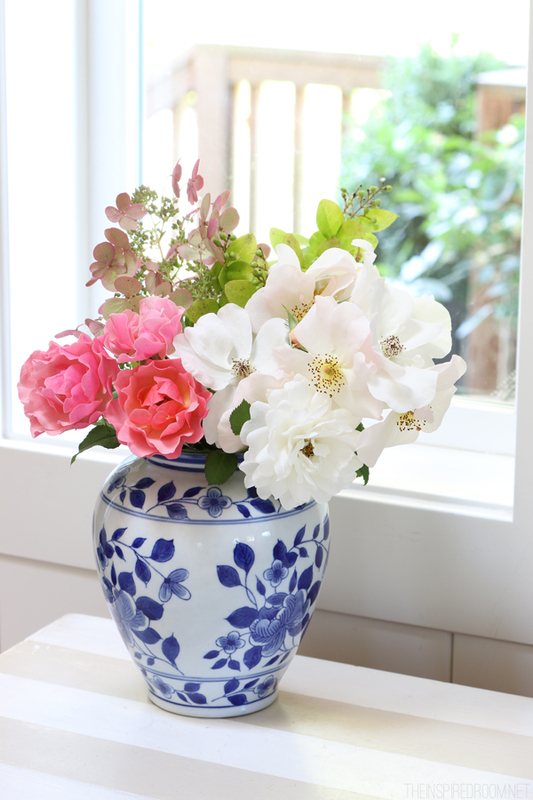 I know when I said my first YES in starting The Inspired Room and then the blog, each subsequent YES required me to be more and more brave and step way outside my comfort zone. I often tell my husband to not talk to me about what I might have to do next year because agreeing to write eight books was probably the scariest thing I’ve ever done. I can’t imagine what my next yes might look like and honestly, I don’t even want to know right now! Heheh. Sometimes my philosophy is just to say yes to scary things and take the rest a day at a time. Saying yes to the right things and no to the rest makes all the difference in my ability to stay sane, to be so happy with what I do, and my ability to feel like I’m not just spinning my wheels. I still get tired. I sometimes say yes to the wrong things and regret saying no to other things and when I do, I really make a mess of things. Distinguishing where to say YES and when to say NO is sometimes difficult, but Lysa’s advice is insightful, empowering and inspiring. My scary season of book writing isn’t done yet. While my first manuscript is in, I’m working on several other books so the learning process continues. But I can say for certain that one scared-out-of-your-mind YES in the right direction can set you off on a life and soul adventure you might never have dreamed of! What are some yesses you are afraid of and nos you should offer more often? Read more about my book writing adventure and 7th blogging anniversary here. 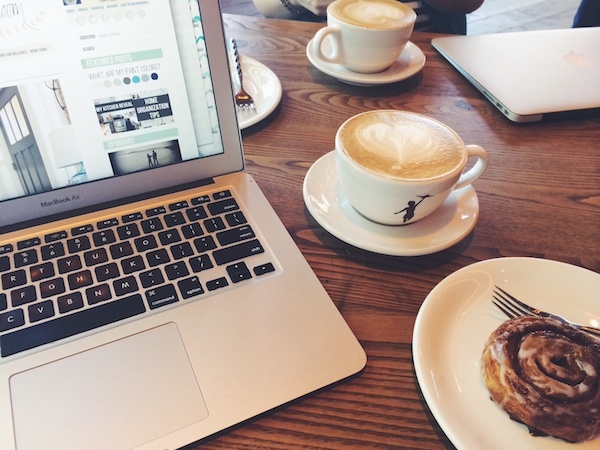 See this post about my blogging journey and tips for bloggers here.